NEW: Use Mixpanel as a data source – How can we help you today? 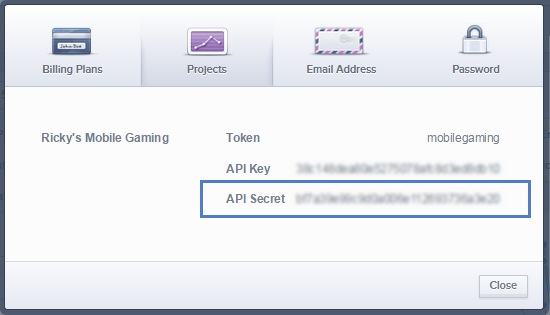 Find your Mixpanel API Key and Secret. Craft a query and enter it into Klipfolio. Complete the data source creation process. Note: This guide assumes that you already have an active Mixpanel account. To create a data source using Mixpanel, go to the New Data Source page in Klipfolio and select the Web Accessible Resource option. Open a new window in your browser and log in to your Mixpanel account. From the top right menu, select Account. Use your API Key and API Secret in your Mixpanel query. Mixpanel offers a variety of query options from which you can retrieve data. All of them use Signed Authentication. Refer to the Mixpanel Data Export API to find out more. A great way to get started is to copy the query examples below into Klipfolio and fill in the blanks with your information. Then, try creating your own queries. Open the Funnel from which you would retrieve data. Navigate to the URL, copy the Funnel ID and paste it into your query. For this example query, replace event names, for example EVENT 1 with an event name in your Mixpanel account. Because of the signed authentication, event names are repeated twice in the query.